We're back for another edition of our Mockingjay Part 1 Countdown. It's week 8, so naturally we will be discussing Chapter 8 from Mockingjay. Chapter 8 starts off with the aftermath of the attack on District 8. Katniss is banged up, and she spends a night in the hospital. After a conversation with her mother, who had not known she'd gone to District 8, she is taken to Command in a wheelchair. She meets with Cressida, Messalla, and the "insect" cameramen first. Castor introduces himself and his brother Pollux, who is an avox. 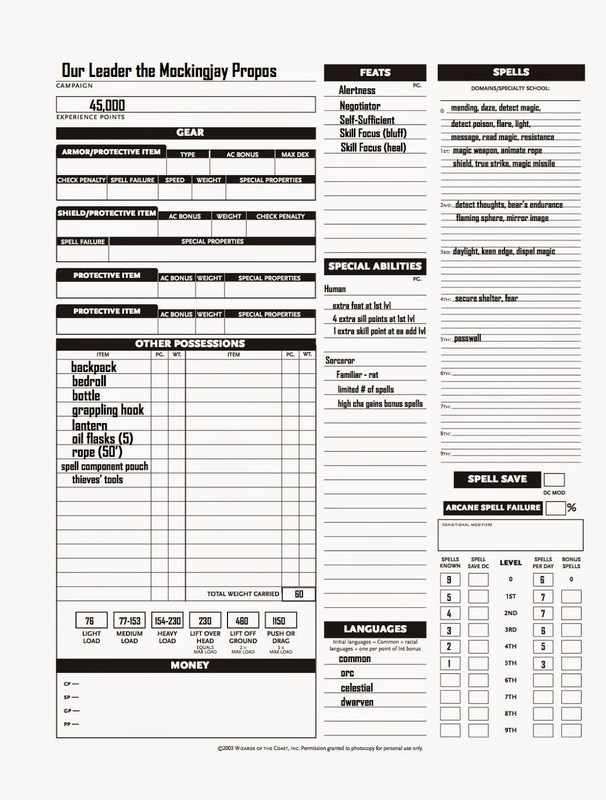 Yes, a caster Castor D&D 3.5 character sheet. 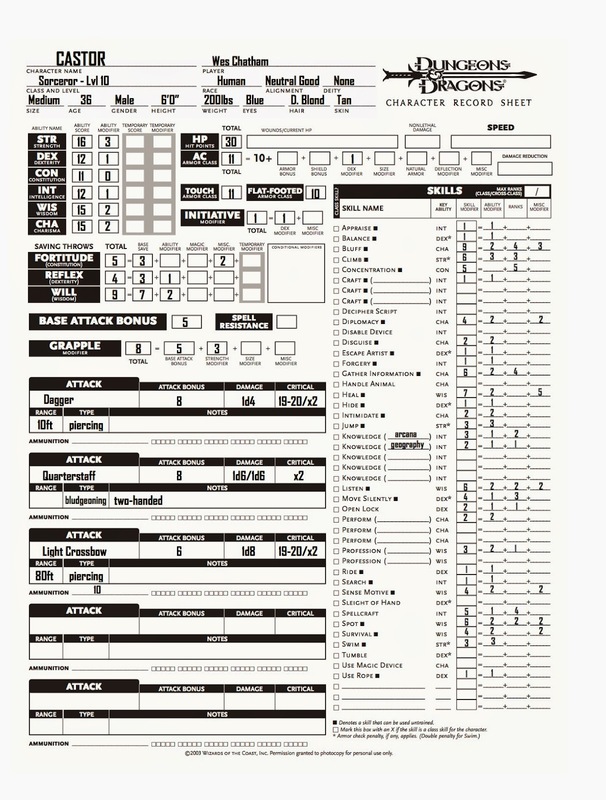 I created a level 10 sorcerer, with emphasis on charisma-based skills because Castor speaks for Pollux, and I imagine he did a fair bit of negotiating on his brother's behalf while buying his way above ground. Also, I gave him a relatively high strength modifier because I imagine it would take a lot of strength to carry his camera everywhere. Enjoy! After everyone enters the meeting, Katniss watches the propo that has aired. I'm really looking forward to actually seeing this propo, and maybe we will get to see it being aired for the districts instead of Katniss watching after the fact. Katniss realizes that Coin does not know that she disobeyed orders and removed her earpiece, and she notes that Haymitch is angry with her for it. After some discussion of other propos they will put together and air, including ones featuring dead tributes like Rue and Mags, the meeting ends, and Katniss falls asleep in the hospital. When she wakes, Haymitch is there to confront her about the earpiece, threatening to even have a chip implanted in her where he can talk to her whenever he wants. Katniss and Finnick watch another propo that was put together from District 8 footage, and immediately after, the second Peeta interview airs. Katniss notes how he is in visibly worse shape than she saw him in the first interview, and she realizes the first interview could've been taped long before it was aired. This interview is the first real hint of what the Capitol has been doing to Peeta since the arena blew up. He cautions Katniss about who she is working with, and when the interview is over, Finnick and Katniss agree to pretend they hadn't seen it. And when Fulvia and Plutarch show up later, they do not mention the interview. I'm really looking forward to seeing Peeta's true state. Whether or not they will show this interview, I'm not sure, as they could easily cut this out since it is short. We may not see him again until the interview where he warns 13. However, if the focus of Part 1 will be getting Peeta back, it may be beneficial to drop more hints about Peeta and also to start putting doubt in Katniss's mind about whether she should trust the rebels. So far we haven't seen much of what goes on in this chapter in the promotional materials, so it can go either way. Tune in next week when we discuss Chapter 9!